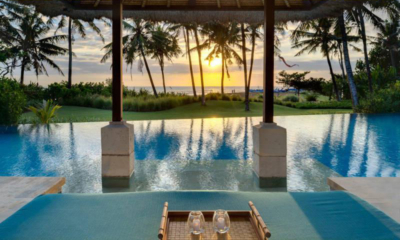 There is something utterly peaceful and grand when you first encounter Villa Yoga. Perhaps it is its very layout with a 1400sq m garden that spreads like a verdant cover to protect it from the hectic pace of Seminyak, or the very manner in which the little bungalows and pavilions are spread around its 25 m pool. At the very onset one is filled with an enormous sense of satisfaction at the look of a space so tranquil and gracefully large. The rustic resplendence of the villa converges beautifully with the a splendour that is so organic evident in the artifacts on display, the space given for spiritual pursuits and the absolute sense of homogeneity with which the villa’s décor and the layout seem to come together. 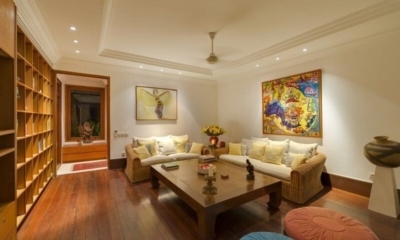 Here is that experience in the heart of Seminyak that is high on privacy, rejuvenation, ambient surroundings and the finest in amenities, all rolled into this large seven bed roomed estate. The very lay out of the seven bedrooms of the villa ensure that each of them comes with a wonderful view either of the pool itself or of the greens all around and thus they open out to balconies, sit-outs and in one case a tiny little private garden. You would be welcomed with the bright shine of the sun when you wake up each morning and enjoy the freshness of the sea breeze through the wide open French windows. The ensuite bathrooms and the king sized beds in each room is because of the spaciousness of each of the rooms. Solid wood furnishings, some hand carved and sourced from local artisans from the island, soft white drapes and hand woven muslin makes for a super luxurious feel –simply soak in the relaxing coolness of each room, with its long windows, the view beyond, and the air conditioned comfort. The rooms come with soft mattresses, the cool clean sheets, adequate space for your wardrobe storage and even an outdoor shower, right under the Balinese sky. Each bedroom also gets its own privacy by way of little spaces like sit outs, balcony options and a verandah that makes space between rooms on the top floor. The focus of all that one wishes to share together will happen mostly in this rather well endowed living room that does become somewhat of a hub of the setting. The traditional furniture, hand craved sofas, the low hanging little Buddhist prayer flag, the little detailing of fresh flowers, the paintings on the wall and the little sign board that sends out a heartwarming message to all guests-there are so many little details that go into making the villa Yoga a perfect place for togetherness. A meeting of minds-where you could read, listen to music on the I-pod, watch a movie or simply share a meal on the large teak dining table remembering the exploits of the day. There is a kitchen which would be perfect for you to make that healthy salad , ingredients of which you could pick up from the local market. A self service environment you are free to use the gadgets and appliances to make yourself a great meal with a little help. You are allowed to get your pets to the villa and what better for the soul than the company of all whom you love and a guitar in your hand-yes-that’s right-spend evenings practicing on a guitar as the villa has some instruments to hand out to its guests. The pool is 25 m long and dominates the outdoors with its brilliant blue presence reflecting the ever-changing colors of the sky. Given the warm weather, you sure are going to be pretty much close to it all day. Even the beach which is a mere 1 km walk from the villa will not keep you away from it. Enjoy lounging by its side, or revv up your morning swimming a few laps. The yoga pavilion truly is the high point of the villa layout, a separate entity and yet not quite separate. It’s at the end of the long stretch of the garden away from the noises that may be emanating from the pool and the living room. A classic resort if you have yoga and meditation on your mind, this is the ultimate space where your mornings could begin with the surya namaskar, and your days end with some transcendental meditation. In fact it would not be wrong to call it a yoga retreat-to be able to evolve in the surroundings so perfect where yoga seem to help you connect even more intrinsically with your body. Be it hammock in the garden, correcting your yogic posture in the yoga pavilion or simply meditating early in the morning on the lush lawns, there is something simple and pure in the way the villa connects with your inner self. With the Villa Yoga allowing you so much for all your senses to revel in, there is also the entire town to explore. Being so close to things of tourist interest be it cafes and restaurants, temples and local bazaars, the beach and the most happening of night clubs all around –you sure are going to enjoy the town and what it has to offer. And, if you are nature buff, there are paddy field to wade though, jungles and forest to trek through and a volcanic high point from where to watch a sunset. The villa Yoga retains its credibility as the finest place to come and relax and rejuvenate in the real sense of the word because of the excellent services on offer and a staff force that makes it happen. Right from the pool attendants to the maids, the security guards to the driver on call, there can be so many people who work tirelessly to make all your wishes materialize and at the same time keep the villas looking clean and superbly comfortable. Sure it is as great a yoga retreat as there can be, but the spaciousness of the villa also makes it a perfect getaway for corporate colleagues out to rejuvenate after a hectic year of number crunching; or a family out to celebrate an anniversary. There are so many possibilities of a time well spent in the company of people you choose to be with! All group activities and plans can be worked out with the help of the villa manager. Perfect for a family holiday or retreat as the villa has 4 rooms with singles beds. Great location, walking distance to Seminyak.